Ian Wilkinson has taken the helm of the Jamaican Chess Federation and has given the island's chess community a shot of adrenaline with his boundless energy and… confidence. Having only learned the moves four years ago, the erudite lawyer is perhaps known best for his enthusiasm and ambitiousness. With "Jamaican Pride" flowing through his veins, his diplomatic persona befits his role as the island's chess Ambassador and will certainly lend greater visibility to the island. The Chess Drum presents Mr. Wilkinson!! TCD: Tell us where Jamaica is (for those that don't know) and what kind of country it is (climate, terrain). WILKINSON: Jamaica is an absolutely magnificent country. Located in the Caribbean just 90 miles from Cuba, it has a rich history which commenced many centuries of years ago with the aboriginal Arawak Indians who named the country Xaymaca" (translated the "land of wood and water"). Christopher Columbus, who came and saw the Arawaks, allegedly "discovered" the country in 1494 and the English settlers, who came in 1655, eventually gave the island its current name. The climate can be described as "summer 365 days of the year" and the country has some beautiful mountains with the world-famous Blue Mountain (after which the coffee brand is named) reaching as high as 7,400 ft. "Independence" was achieved from Great Britain on the 6th August, 1962. TCD: Who were some of the first members of the national team and are there any celebratory triumphs in the country's history (any recorded games, pictures)? WILKINSON: With the assistance of the JCF, other players such as many-time national champions NM Dr. Harold Chan (who also served as a VP) and NM Robert Wheeler (the current Secretary of the JCF), Frederick Cameron and William Roper, the immediate past principal of the Norman Manley Law School, played in individual and team tournaments in Cuba, Mexico, Venezuela and Miami. These individuals I have come to call "the founding fathers." Jamaica first participated in the Chess Olympiad in Buenos Aires 1978. In 1984 at the Thessaloniki Olympiad NM John Powell won a silver medal on board 4 with a score of 7/9. In 1990 at the Novi Sad Olympiad Christine Bennett brought the women firmly to the fore by scoring 6/7 to win a silver medal on board four. In the 1992 Olympiad (Manila, Philippines), Kingston College past student NM Dr. Kevin Brown created quite a stir when, playing with the Black pieces, he beat the Philippines' Grandmaster-elect, Rogelio Antonio Jnr. in a rousing Scotch. To date this is the only victory by a home-grown Jamaican over a Grandmaster. TCD: Provide us some brief personal information (your hometown; where you learned to play chess, your tournament participation, and your ascendancy to the JCF's Executive Director). WILKINSON: I was born in Kingston, Jamaica where I learnt the moves in mid 1999 as an "old man" (then 34 years old) after I had bought a chess set as a gift for a child and decided that I should know how to play the game to explain it to him. I learnt the game from reading the instructions which came with the set and which I later realized to be inadequate or incomplete. 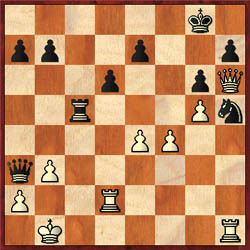 I eventually learnt the rules by trial and error and played my first competitive over-the-board game (with the black pieces against a King's gambit) against former national junior champion and current candidate master Equitable Brown in my first ever tournament, the Jamaica Open, in October 2000 and was easily routed. 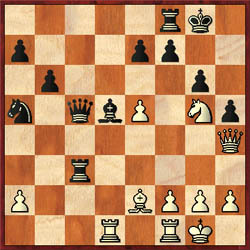 I had sweet revenge in December, 2002 against Equitable in an exciting Sicilian Dragon where I had the white pieces. NM Shane Matthews, who has the distinction of winning the most Jamaican Championships (seven), has also done Jamaica proud with some sterling battles with grandmasters. Shane's first Olympiad was at Lucerne in 1982 and he played in his seventh Olympiad in Bled in 2002. 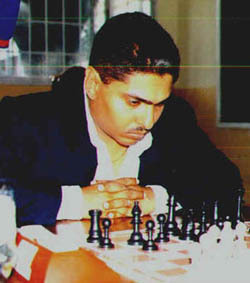 In the Istanbul Olympiad of 2000 while playing on board one, he had a noteworthy 5-game unbeaten streak against very strong opposition losing narrowly to the Cuban GM Walter Arencibia after having obtained a winning position, and drawing with Albanian GM Erald Dervishi and Iranian GM Ghaem Maghami after obtaining great positions in both games. In 1991 former national champion NM Neil Fairclough won the Caribbean Open held in Jamaica and in 1993 NM Jomo Pitterson won the Barbados Open junior tournament. St. Jago past student Grantel Gibbs created history in 1999, becoming the first Jamaican chess player to achieve the title of FIDE Master. Cornwall College's Warren Elliott followed suit in 2001, giving Jamaica only its second ever FIDE Master title. Although I have not played in many tournaments, I have made steady progress playing approximately 100 games and my rating (which was in the 1300s over a year ago) is now 1708, its highest ever. The highlights of my brief "tournament career" include taking part in the World Open in Philadelphia in July 2002 finishing 20-odd out of 160 competitors in the U-1400 section. One of my favourite games from that tournament is the tense sixth round encounter with the Black pieces against Jared Speicher. TCD: It's amazing… your emergence as the JCF President after such after such a short time. How did this happen? 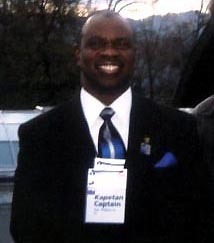 My FIRST assignment as an official was as Captain of the Jamaican delegation to the 2002 Chess Olympiad in Bled, Slovenia at the request of the then President of the Jamaica Chess Federation (JCF) FM Grantel Gibbs. My association with the Presidency of the JCF began in March 2003 when I accepted the invitation of the council of the Jamaica Chess Federation (JCF) to serve as Interim President after FM Gibbs had stepped down. In June 2003 I was elected unopposed as president at the JCF's 35th annual general meeting. Many persons were surprised that I decided to accept this daunting challenge as I already had my plate quite full, being an Attorney-at-law with a hectic practice, a lecturer at the Norman Manley Law School and a member of a number of civic groups including the Jamaican Bar Association, the Advocates Association and the Kingston College Old Boys Association. TCD: Who would you say have had the greatest influence on Jamaican Chess and what does the future bode for Jamaica Chess? WILKINSON: Jamaica has had a number of influential players. These include the late Enos Grant, NM John Powell, Dr. Harold Chan, Robert Wheeler, NM Neil Fairclough, and the late Attorney-at-law NM Orrin Tonsingh just to name a few. More recently there have been FM Grantel Gibbs, FM Warren Elliott, NM Jomo Pitterson, NM Duane Rowe, NM Russel Porter, NM Geoffrey Byfield, NM Mark Holness and candidate masters Peter Myers and Humphrey Gayle. These players dedicate a lot of time and effort playing against a number of the younger players in addition to training them. Not to be forgotten is NM Shane Matthews who, in his third decade as a chess player, has been a great influence on a number of players, especially the ever-improving crop of juniors who, like so many others, have been impressed by his longevity. Shane had the privilege of spending time in Russia in 1988 learning a lot of coaching techniques which semed to have served him tremendously as a player. The JCF hopes to tap into his reservoir of knowledge in order to benefit the current and future generations of players. (Note: Wilkinson also mentions Jamaican-born GM Maurice Ashley as a positive influence on Jamaican chess. Jamaica has a great future. There are quite a few promising juniors. These include Ras Malaku Lorne who, at 18 year old, is rated 2295 and Jamaica's most likely candidate to be national master before the end of the year. He has had an excellent year, winning the inaugural Harold Chan Open in July ahead of a strong field which included NM Shane Matthews. Lorne, a serious yet pleasant Rastaman, hopes to follow in the footsteps of his father, Ras Miguel Lorne, and become a lawyer. There is also the tactically astute Daren Wisdom, who at 20 year old is ready to take off to a greater chess plateau. Wisdom, after finishing an unbeaten second in July 2003 in the Barbados Sagicor Open, created shock waves by beating the defending champion and eventual winner NM Shane Matthews in his first national championships in August. He then had a very creditable 5½/9 performance in the recently-concluded 2003 CAC Junior Championships in Venezuela. Like Lorne, Wisdom is knocking on the door of "National Master" and, with a little luck, should realize it this year. Then there is the talented Alain Morais who finished third in the said Sagicor tournament and, at 2100+, is also poised to become a master; the auspicious Brandon Wilson, a real talent who impressed the well-known Ukrainian coach Aleksander Vaisman who did a coaching stint in Jamaica in the summer of 2002; Andrew Robinson who was the MVP of the 2002-2003 high schools tournament; Ryan Blackwood, David Lai, Phillip Pryce, Brian Ewbank and Scott Jones just to name a few. TCD: Are the women on the island very active? Since the 2002 Bled Olympiad Deborah Richards has led the charge for women's chess in Jamaica winning tournaments and sectional titles and giving experienced male players nightmares. In the absence of Zhu Hui (due to school/exams) and Maria Palmer (who has migrated), Richards easily retained her national women's title in 2003 and in Judit Polgar-like fashion, is anxious to do battle with the men in the national championships. Although she did not fare so well in her first CAC junior champs (in 2003) the experience she has gained by clashing with WGMs and WIMs can only serve her well. The JCF plans to put increased effort into women's chess by increasing the number of women's tournaments, having more coaching sessions and arranging frequent matches against strong opposition, including the top juniors, candidate, and other Masters. TCD: Thank you for sharing with us the history of Jamaican Chess. Nuff respect!! Interview conducted via e-mail exchanges: October 2003. 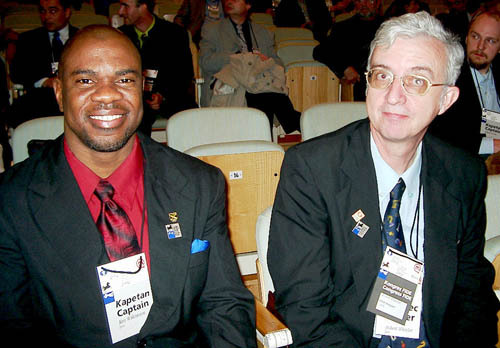 Jamaican Federation President Ian Wilkinson with FIDE Delegate NM Robert Wheeler at the opening ceremonies at the 2002 Olympiad in Bled, Slovenia. Photo by Jerry Bibuld. TCD: Please tell us when the JCF came into being and when it began to organize and participate in international competitions. WILKINSON: The JCF was officially founded on 22nd February, 1969. Arguably the chief architect responsible for its formation was the late Enos Ayrton Grant, a prominent lawyer and chess visionary who was elected the first President. Mr. Grant and another former President, NM John Powell, were instrumental in having the JCF officially recognized by FIDE in 1972. In 1972 Harold Chan and William Roper teamed to win the commonwealth Caribbean team tournament in St. Lucia. In 1975, Jamaica had its first ever National Masters when Chan, Robert Wheeler and the late Thomas Figueroa all earned the title. Under the JCF by-laws, one can become a National Master by attaining a rating of 2200 and holding it over two consecutive tournaments. Chan also played in the Capablanca Memorial of 1979. In 1976 sixteen year-old Sheldon Wong, regarded in some circles as Jamaica's greatest ever chess talent, won the National Championship and then represented Jamaica the same year at the 15th World Junior Chess Championships in Groningen, Holland, winning a brilliancy prize for his second round Grunfeld win against the Israeli Nir Grinberg. Wong became a national master in 1977 and retained his national title the same year.